Find the perfect cactus or succulent and care for it with the help of the RHS. The Royal Horticultural Society's definitive guide to propagating, nurturing, and designing with more than 200 cacti and succulents. How can you encourage your bunny ear cactus to flower and flourish? What is the best method for propagating an echeveria or kalanchoe? What exactly are living stones, and where do they grow in the wild? 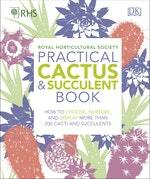 RHS Practical Cactus & Succulent Book is the ultimate reference book for cactus and succulent enthusiasts. An extensive illustrated plant directory profiles more than 200 succulent and cactus varieties, with instructions on how to grow each one, while information dashboards offer fascinating facts and quirky stats about different plant families, such as Euphorbia and Echinopsis. Show off your plants with inspirational display ideas and step-by-step projects. Follow the simple propagation instructions to increase your cacti and succulent collection for free. Keep your plants healthy with advice and tips for care and cultivation. Drawing on the unrivalled expertise of the Royal Horticultural Society, RHS Practical Cactus & Succulent Book is everything a cactus-lover needs. Love RHS Practical Cactus and Succulent Book? Subscribe to Read More to find out about similar books.